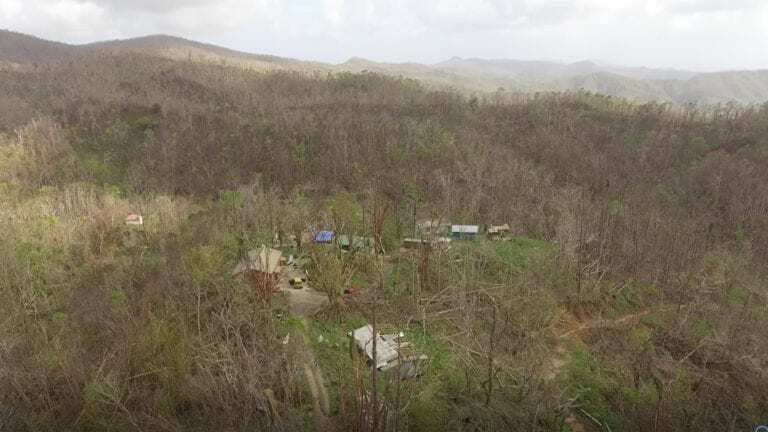 On Sept 20, 2017, the eye of Hurricane Maria passed directly over the Las Casas de la Selva, Sustainable Forestry and Rainforest Enrichment project in Patillas, Puerto Rico, leaving behind devastating damage to trees, buildings and infrastructure. We are raising funds to develop resilient architecture with the help of the Schools of Architecture from University of Puerto Rico and University of San Francisco. Together we can create a homestead to withstand hurricanes. Above three weeks before the hurricane, 20th Sept 2017, and below, three weeks after Hurricane Maria. Las Casas de la Selva project was initiated in 1983 by the Institute of Ecotechnics, an international non-profit organization pioneering innovative approaches to healthy land-use in rainforest, grassland, desert, city and ocean biomes. Tropic Ventures, LLC,manages the the 1000 acre project in Puerto Rico, using a unique approach to forest enrichment in secondary rainforests called “line-planting”, where valuable tree species are planted in cleared lines or blocks, simulating forest openings when tall trees fall with minimal disturbace of the surrounding forest, offering critical soil erosion protection, preserving biodiversity, and facilitating forest development. The immediate future of this project involves land-restoration and design of buildings to withstand increasing, future climate challenges. The long-term involves continuing forest research, silvicultural practice, planting, care, raising, and harvesting of valuable hardwoods for use, and the initiating of world-class workshops, conferences, and seminars in arts and sciences. CONFERENCE/HOSPITALITY CENTER: For world-class gatherings in science, art, and management. A large facility with ample indoor space for conferences, seminars, and workshops, as well as performances, dance, and theatre productions. 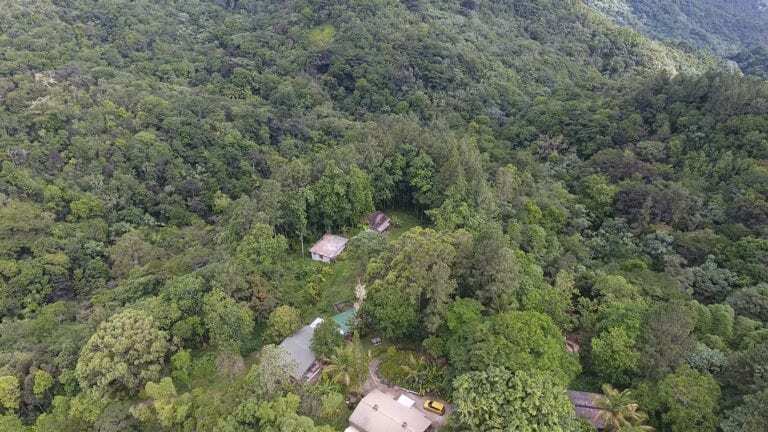 This whole facility is totally hurricane proof, with windows affording spectacular views over the rugged mountain terrain and forests and down to the Caribbean, a literal eye on the rainforest. EYE ON THE RAINFOREST VIEWING CENTER. The Conference space is designed with a very large ‘bullet-proof’ window that will be at least 20-30 feet long and 4 feet wide. This is a place where people can come to watch the seasonal and daily changes. Here at a ridge of the mountain the views are spectacular with fast-moving clouds producing alternations of rain and sun. During a hurricane, the center provides a safe refuge and watching center. COMMUNAL DINING area that can cater for up to 90 people, designed with smaller dining areas for resident staff and volunteers. It will feature a professional catering kitchen and furniture and interiors made from stunning Puerto Rican woods. ROOMS: This Research Center will be home for up to twelve people. Each of the 12 rooms has a hospitality or sitting area, a balcony and view, a double bed, a desk, storage area, and bathroom, some shared. Furniture and interiors feature wood from the island’s trees. Thank you! We really appreciate your support.